We love our dogs, pure-bred or otherwise. But there are good reasons to learn about our dogs' ancestry, even if we can't be formally introduced to the parents. Behavioral traits, personality, and potential health risks of each breed are important to know, but it's also fun to learn exactly which breed has those cute little ears, or that scruffy fur on its back. A Canadian company is selling its Canine Genealogy Kit through Hammacher Schlemmer. It's $59.95 and includes the test kit and a mailer to send your pup's DNA to the lab. You simply rub the cotton swab inside of your dog's cheek and send it off in the mailer. The lab will compare your dog's DNA to the DNA sequences of thousands of pure-bred dogs in its database -- 63 different breed types. 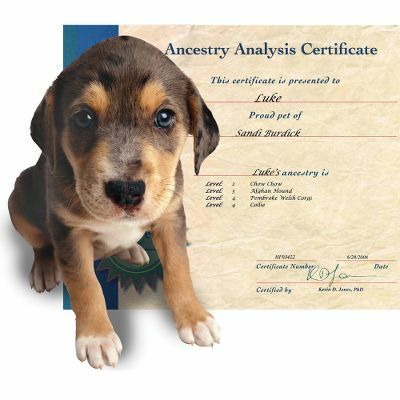 In about three weeks you will receive a certificate from the lab with your dogs unique ancestry, explaining what traits of each breed are likely to have been passed on to your dog. Then, you will know what to look out for and guard against or reinforce. I'm thinking of getting one of these Canine Genealogy Kits myself, but I haven't figured out how I can surreptitiously swab my mother-in-law. She got that aggressive behavior from somewhere!